Opt to turn off the tab by unchecking “Show this tab on your profile” so that it isn’t visible on your profile. 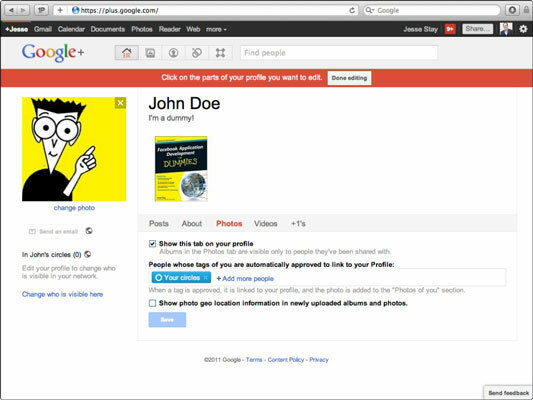 Doing so will keep others from seeing your Google+ Photos, for example. Choose who can tag photos of you — you can choose individual people or individual circles of people. This is a great way to prevent spam tagging of you in photos. Turn off the geo location option so people can’t tell where you took the photos you store in your profile. +1s: These are the things you’ve “+1d” (recommended) around the web. Every time you click a +1 button, the website you +1d will appear on this tab. You can also click +1 next to each Google search results on Google search — every time you click, the URL you +1d will appear here. You can opt to have these +1s appear to your friends when they visit your profile. Buzz: Google Buzz, which you’ll see under Buzz in Gmail, is basically the predecessor to Google+. In Buzz you can choose to automatically aggregate things like Google Reader shares and Twitter posts and other things you do around the web. If you want your Google Buzz shares to appear on your Google+ profile, just check the check box next to “Show this tab on your profile” and your Google Buzz shares will appear so your friends can see them. To see your profile in its final form, click Done Editing, which takes you back to your profile. To go back to your stream, click the Google+ logo at the left of the sandbar. The sandbar is the narrow black bar at the top of Google+.